Australians appear to be losing a significant portion of their wealth as home values dissipate, according to recent data from Roy Morgan’s Single Source Survey. Owner-occupied homes shed 5.2% of their value during the December quarter, equivalent to a loss of $270bn. The decline in home values accounted for over half of the decline in gross personal wealth. Over the quarter, the total assets of Australians dropped by 5% to $9.78trn — this means that around $512bn was taken away from the overall personal wealth of Australians. The level of household wealth recorded was lower compared to the previous quarter and was the weakest since 2017. Despite this, the average group household wealth remains over $1m. “Despite the current mainly negative wealth environment, it is important to note that average gross household wealth is 26%, or $207,000, higher than it was five years ago,” Roy Morgan industry communications director Norman Morris said. 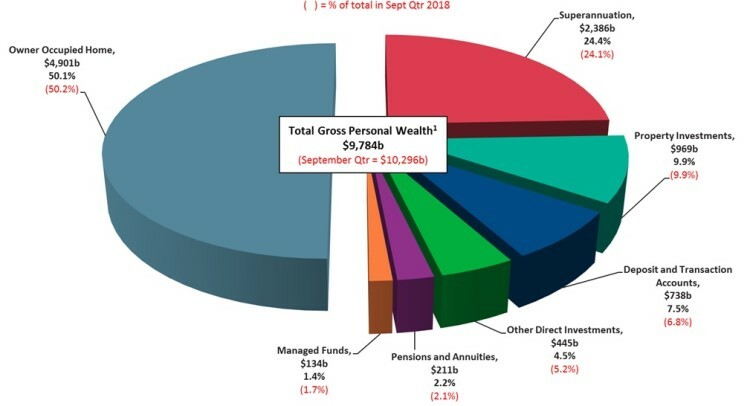 The other half of Australians’ wealth is composed of several things, including superannuation, which grew its portion of the overall wealth to 24.2%. The share of the value of Australians’ deposit and transaction accounts also increased in the quarter from 6.8% to 7.5%. The chart below shows the asset composition of Australians’ gross personal wealth. Morris said there seems to be a tendency to focus on the value of homes when looking at Australians’ wealth even though other assets account for half of the total gross assets of Australian households. For instance, he believes that the slowdown in the Australian Stock Exchange during the December quarter has had a significant negative impact on household wealth, particularly on superannuation. “This combined with falling housing values and the uncertainty around the coming federal election has the potential to further negatively impact household wealth,” he said. Given the volatile environment, Morris said there is a need for policymakers to firmly keep tabs on the wealth effect to foresee potential economic risks. “In order to understand the likely impact on the economy and consumer confidence of what is now commonly called the ‘wealth effect’, it is imperative that household and individual wealth be measured on a regular basis,” he said.